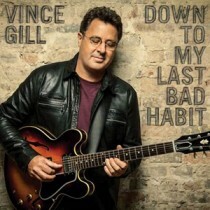 Country legend Vince Gill has announced that his brand new album ‘Down To My Last Bad Habit’ will be released on 12th February 2016! The 12-track project includes a duet with Little Big Town on ‘Take Me Down’ as well as a duet with new country star Cam on ‘I’ll Be Waiting For You’. The whole album is written/co-written and produced by Vince himself.